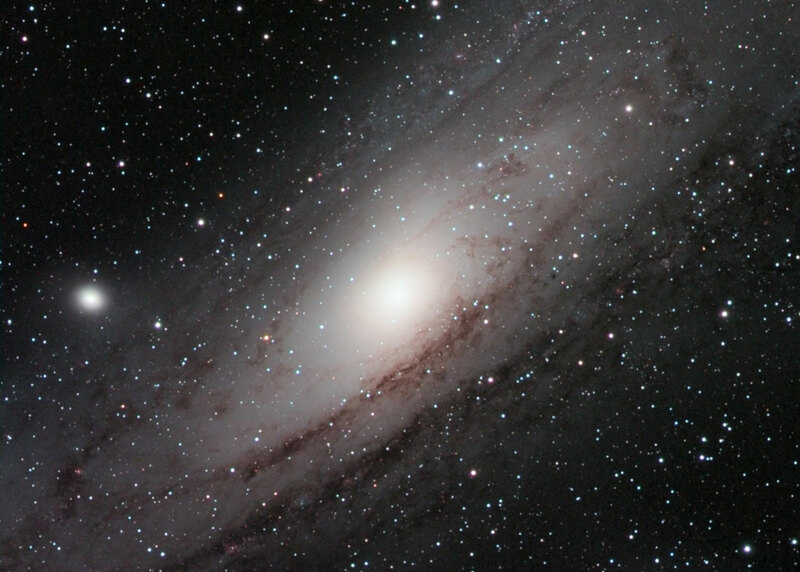 This image of M31 was captured by Adrian Brown in September 2009. The image started out as a short black and white test image for a new motorised focuser that Adrian has been building for his Borg 45ED refractor, but he liked the results and made a full colour image. The total exposure time of this LRGB image is 4 hours 15 minutes for the luminance filter and 2 hours each for the RGB filters. He used the Borg 45ED refractor and his ATK16HR CCD camera. Adrian Brown produced this composite image of the core region of M31 from data taken at three different resolutions. 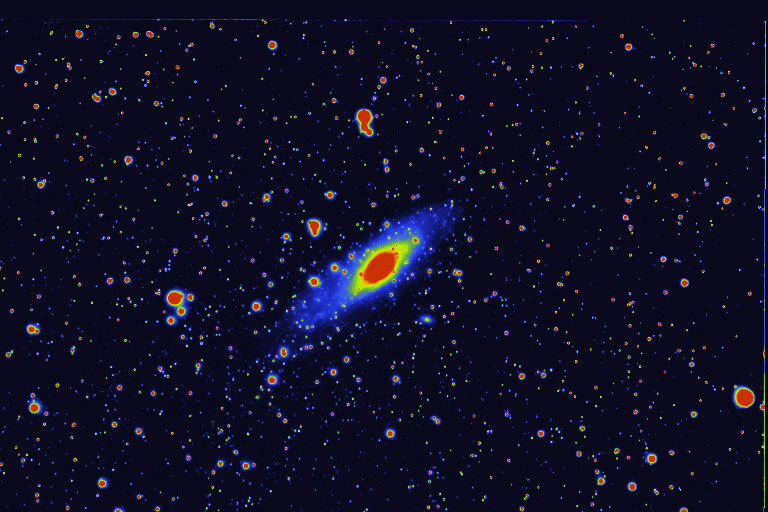 The luminance data was created by combining a mosaic image taken in September 2008 (shown next below this image) with some data of the galaxy core that Adrian captured in 2007, at a longer focal length. This was done to increase the definition of the faint dust lanes at the galaxy core. The luminance composite was then combined with some lower resolution colour data to produce the final colour image. The technical details are for the 2007 Luminance Data: 6 x 5 minute exposures, Astronomik Luminance filter and Astronomik CLS filter, Skywatcher 80ED refractor @ f/7.5, ATIK ATK16HR CCD camera. For the 2008 Luminance Data: 90 x 4 minute exposures though an Astronomik Luminance filter and Astronomik CLS filter, Skywatcher 80ED Pro refractor @ f/6 using a William Optics 0.8x focal reducer, ATIK ATK16HR CCD camera. 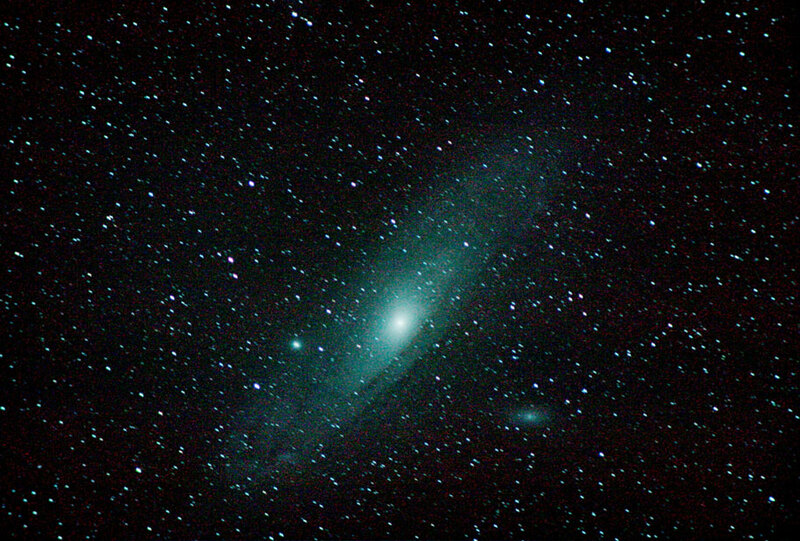 For the 2008 Colour Data: Red 13 x 4 minutes, Green 14 x 4 minutes, Blue 12 x 4 minutes, Skywatcher 80ED Pro refractor @ f/6 using a William Optics 0.8x focal reducer, Astronomik RGB filters and Astronomik CLS filter, ATIK ATK16HR CCD camera, binned 2x2. Maxim DL 4.53 was used to calibrate and stack the raw exposures. Registar 1.0 was used to align and resize the different resolution data. Photoshop CS2 was used to process and assemble the final colour image. This image of M31 is a 4 frame mosaic captured over a number of nights in September 2008 by Adrian Brown. The technical details are: 90 x 4 minute exposures, Astronomik Luminance filter and Astronomik CLS filter. Skywatcher 80ED Pro refractor @ f/6 using a William Optics 0.8x focal reducer. ATIK ATK16HR CCD camera. Maxim DL 4.53 was used to calibrate and stack the raw exposures for each mosaic panel. Registar 1.0 was used to align each mosaic panel. Photoshop CS2 was used to process the mosaic panels and blend them into the final image. 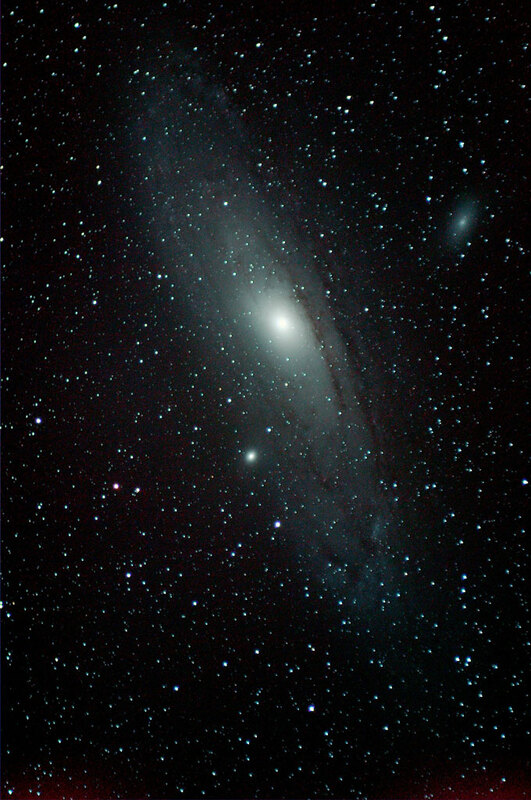 Tony Razzell took the following image of M31 with a home built Audine camera in September 2007. The camera uses a Kodak KAF401E sensor and the image was taken with a 178mm lens at f/4, using a total of sixteen 1 minute exposures stacked using the IRIS program. The dark skies of Pembrokeshire afforded Chris Newsome the opportunity to take the following image of M31 and it's companion galaxies on the 17th August 2007. The image was taken using a Skywatcher 102T telescope with an MPCC (no CLS filter was needed as there were no sodium lights) and a Canon EOS 300D camera. A Skywatcher 80T telescope with a Meade DSI camera was used for guiding. 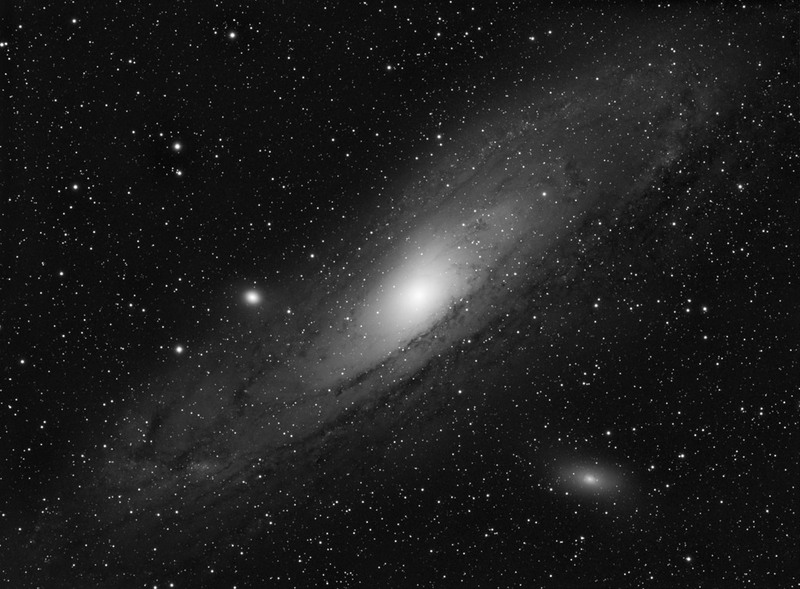 19 frames of 120 seconds each at 800 ASA were combined in MaximDL and processed in CS2. 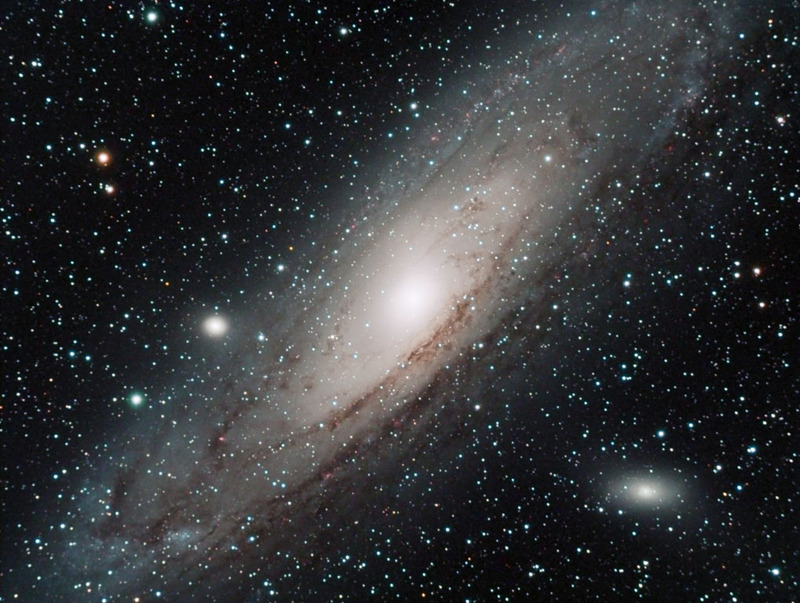 Chris comments that it was so dark that M31 was visible with the naked eye and you could also make out the shape. Chris Newsome took this image of M31 and its companion galaxies M32 (in the 8 o'clock position) and M110 (at 2 o'clock) on the 9th December 2006. The image was taken through a Skywatcher 102T refractor with a Baader MPCC and Astronomik CLS filter and a Canon EOS300D camera. The imaging setup was focused using a Skywatcher Electronic focuser (a device Chris says he is trying to get used to at the moment!). The setup was guided with a Meade DSI and a Skywatcher 80T using a GPUSB controlled by MaximDL. The picture is comprised of fourteen 300 second images (1hr 10min in total) at 800ASA, combined in MaximDL and processed in CS2 using just curves and RGB levels. This image of M31 and its companion galaxies M32 (at five o'clock) and M110 (at 12 o'clock) was captured was Chris Newsome on the 25th November 2006. Chris used a Canon EOS300D camera through a Skywatcher 102T refractor with a 2" Astronomik CLS filter. The spiral structure and dust lanes in M31 are quite evident. The setup was guided by a Meade DSI camera through a Skywatcher 80T refractor via a GPUSB interface controlled by MaximDL. The picture comprises of seven 300 second exposures at 800ASA combined in MaximDL and processed in CS2. 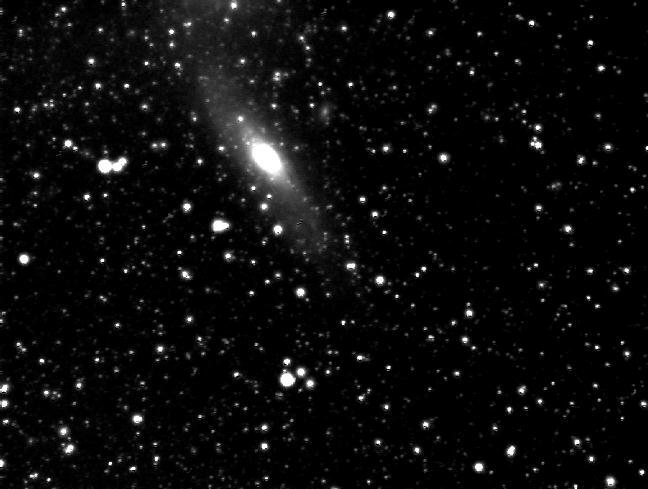 Tony Razzell captured this false colour image of M31 on the 18th November 2006 using a 50mm SLR camera lens and an Audine CCD camera. This uses an unfiltered Kodak KAF401E sensor and the image is comprised of a stack of ten 30 second exposures. This image of M31 and its companions M32 and M110 was taken by Chris Newsome on the 21st January 2006. M110 appears almost as a bright fuzzy 'star' in the 9 o'clock position to the left of M31 while M32 is further out in the 4 o'clock position. This picture represents 'first light' for Chris' new Skywatcher 80T refractor. The Skywatcher is an 80mm achromatic refractor with a 400mm focal length. As it is an achromatic Chris intends to invest in a Baader Fringe Killer filter to redress the red and blue light focusing differences. 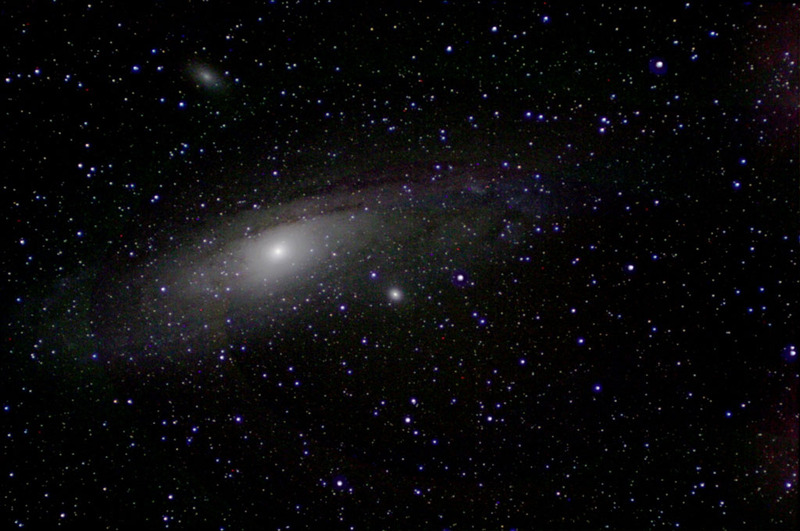 This image was taken with a Canon EOS300D camera using an Astronomik CLS 1.25" light pollution filter. The image is comprised of thirteen 60 second frames at 1600ASA, stacked and dark subtracted in K3CCDTools and then processed using GradientXTerminator, RGB levels and curves in CS2. Chris comments: "Because of the 1600ASA setting, the picture is still a bit 'grainy'. 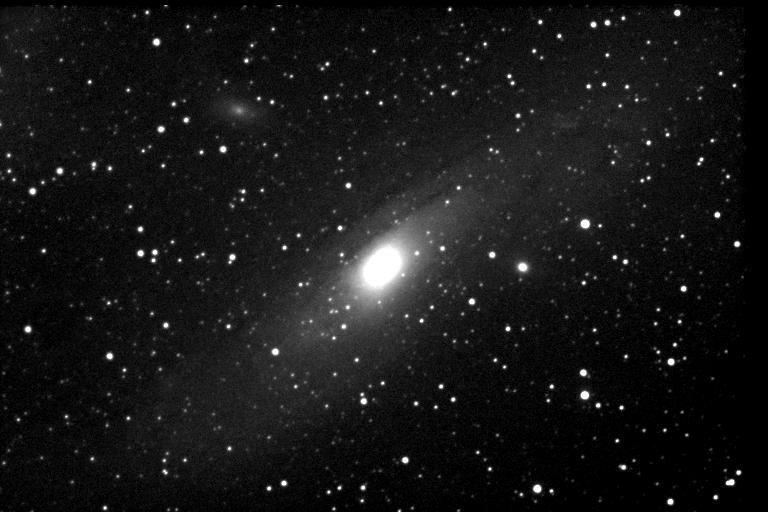 It is useful to start off experimenting with a brighter object that is relatively easy to image hence it is another of M31. I had only roughly polar aligned the CG-4 mount and wanted to see how much light the scope would be able to grasp in a short time. When the setup is more permanent and the exposure time can be increased then I will be able to drop the ASA setting considerably to smooth out the image". 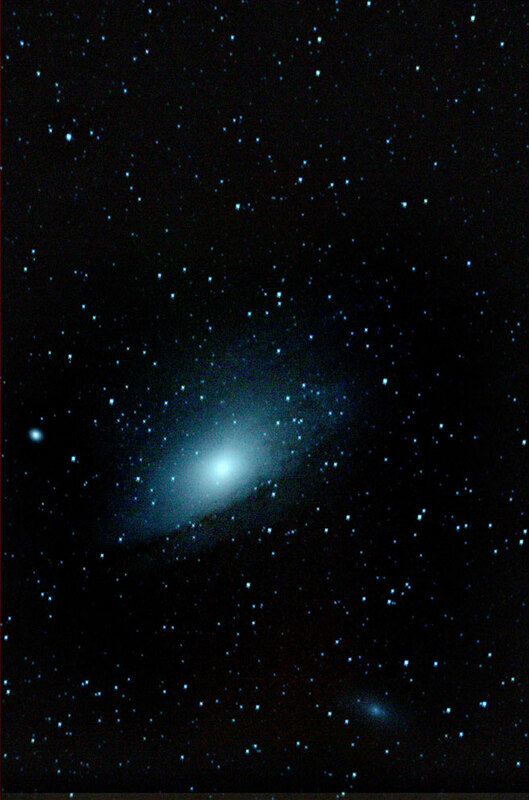 Chris Newsome took this picture of M31 on the 17th December 2005. He used a Canon EOS300D camera piggybacked on a driven Celestron C6-N telescope. The lens used was a 55-200mm set at 175mm and fitted with a Hutech Skyglow filter (to remove the sodium glow from streetlights). The image is comprised of ten 4 minute exposures at 800ASA. The images were stacked and dark subtracted in MaximDL (Chris thanks Adrian Brown for showing him where he was going wrong with his dark subtraction in MaximDL) and then processed in Photoshop CS2 (using GradientXTerminator, curves, RGB Levels and Gaussian Blur). The resulting TIFF image was then converted to a JPEG. 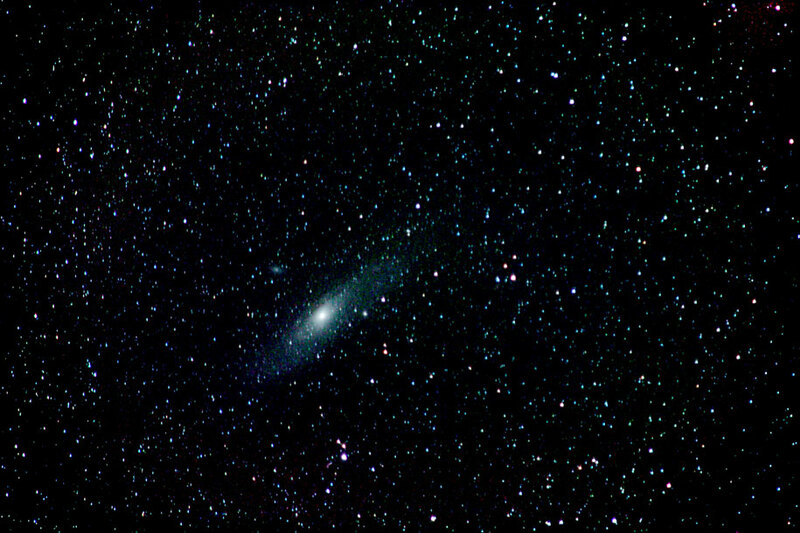 M110 can be seen to the upper left of the core of M31 and M32 (appearing like a bright star) is at the three o'clock position to the core and about half the distance from the core that M110 is. 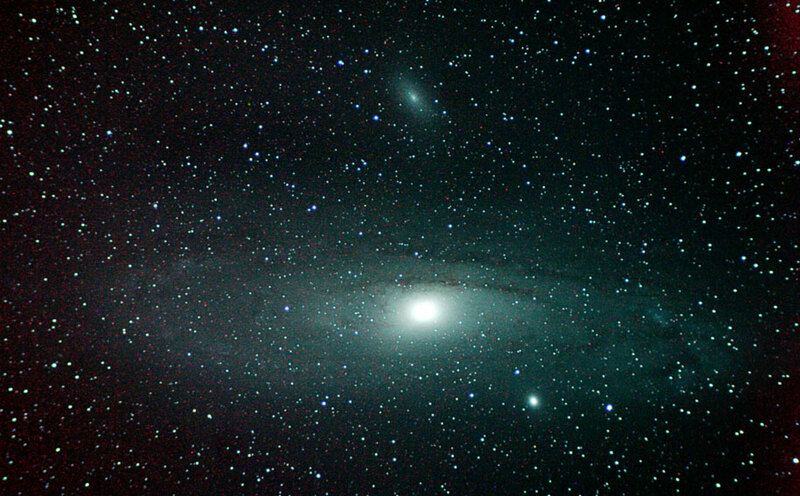 The following image shows M31, with companion galaxies M32 (in the ten o'clock position) and M110 (in the five o'clock position). It was taken by Chris Newsome on the 9th November 2005 using a Celestron C6-N, Canon EOS 3000D at prime focus, 5x60sec frames at 1600ASA, stacked in K3CCDTools and processed in Photoshop (curves, GradientXTerminator and RGB Levels). 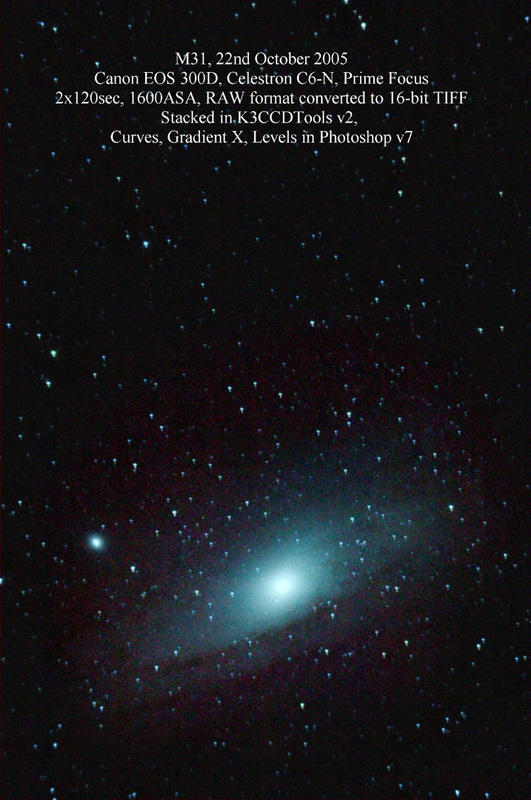 Chris Newsome took the following image of M31 on the 22nd October 2005. Adrian Brown provided assistance in image processing. 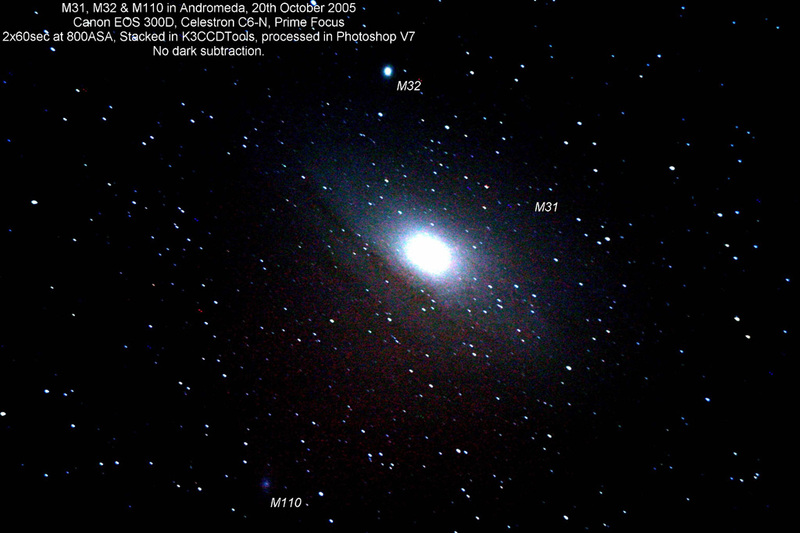 The following image of M31, M32 and M110 was taken by Chris Newsome on the 20th October 2005. Adrian Brown took the following image of M31, M32 and M110 on the night of the 2nd - 3rd September 2005. M110 is the elliptical galaxy in the two o'clock position to the main galaxy M31, while M32 appears like an over exposed star right on the outer rim of M31 and directly below the centre of it in the six o'clock position. The imaging equipment was a Canon 300D DSLR camera with a 200mm focal length lens and a Hutech LPS light pollution filter, piggy-backed on top of a Celestron C11 SCT which was used to autoguide the mount. The raw exposures were taken at ISO 400 to help suppress the buildup of noise - of which there was a lot in the 11 minute exposure. The image was stacked and dark frame calibrated with Maxim DL 4.11 and then further processing was done in Adobe Photoshop via the Curves and Levels tools. Adrian also used a Photoshop plugin called GradientXTerminator to fix light pollution gradients in the picture background. 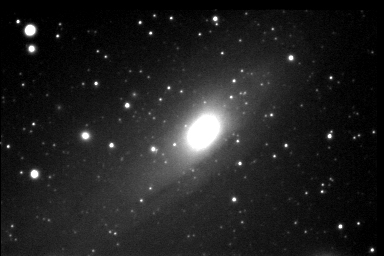 The following picture shows M31 as imaged by Chris Newsome on the 9th August 2005. 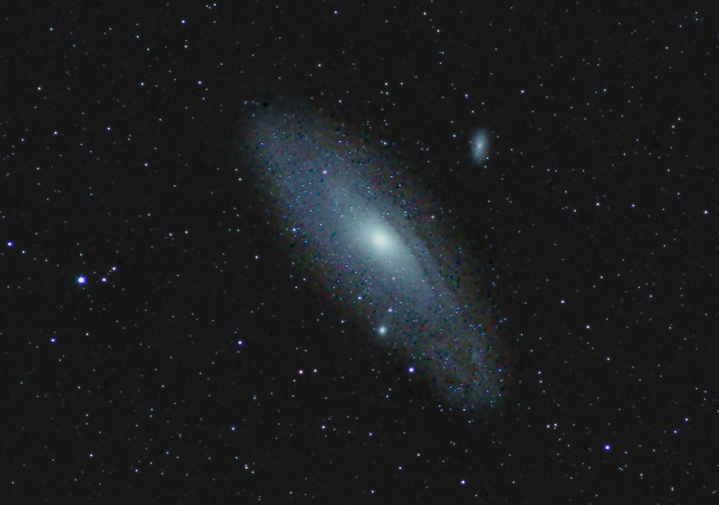 Tony Razzell captured the following two images of M31 using an Audine camera in December 2004. The first was taken with a 50 mm camera lens and is a stack of five 60 second exposures. The second was taken with a 300 mm camera lens and is a stack of five 30 second exposures. 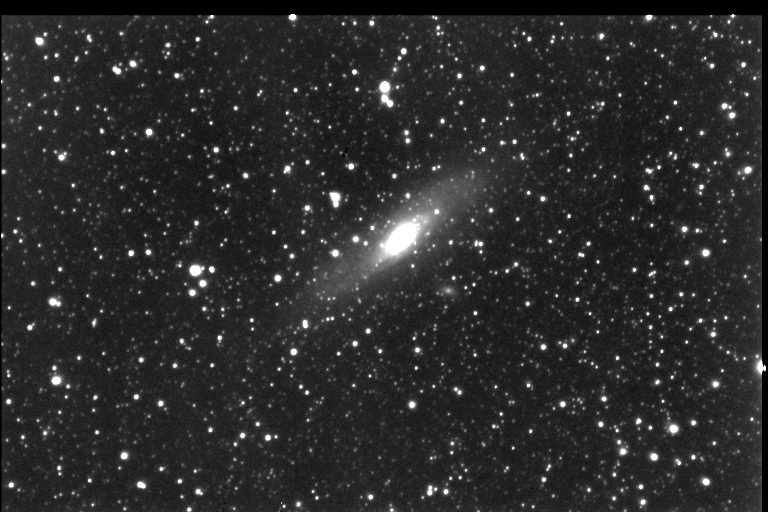 The smaller companion galaxy M32 (NGC 221) can be seen in the 4 o'clock position below M31 in the main photo.